Food has an incredible power to move us. Just as the familiar aroma of a favorite dish can take us back, new tastes can also propel us forward to exciting and unfamiliar places. Traveling vicariously through new flavors and recipes means you won’t need a plane ticket to enjoy these delicious destinations. First stop is Northern Africa. 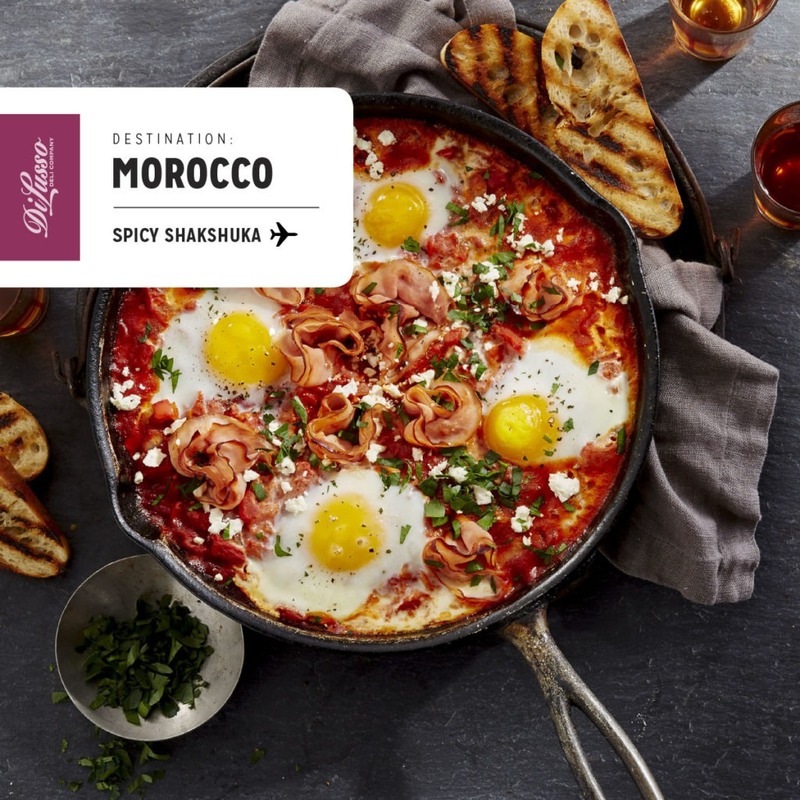 More specifically, Morocco and neighboring Algeria and Tunisia for a bright, spicy ragout-like dish that’s as interesting to say as it is to eat – Shakshuka. [shahk-SHOO-kah] It’s traditionally prepared with poached eggs in a zesty, savory sauce of tomatoes, chili peppers and onions. A variety of meats and saltier cheeses are often added to the dish too. Cumin is usually the spice of choice. One of the most unique one-pot meals, it’s both prepared and served in a simple cast iron skillet. 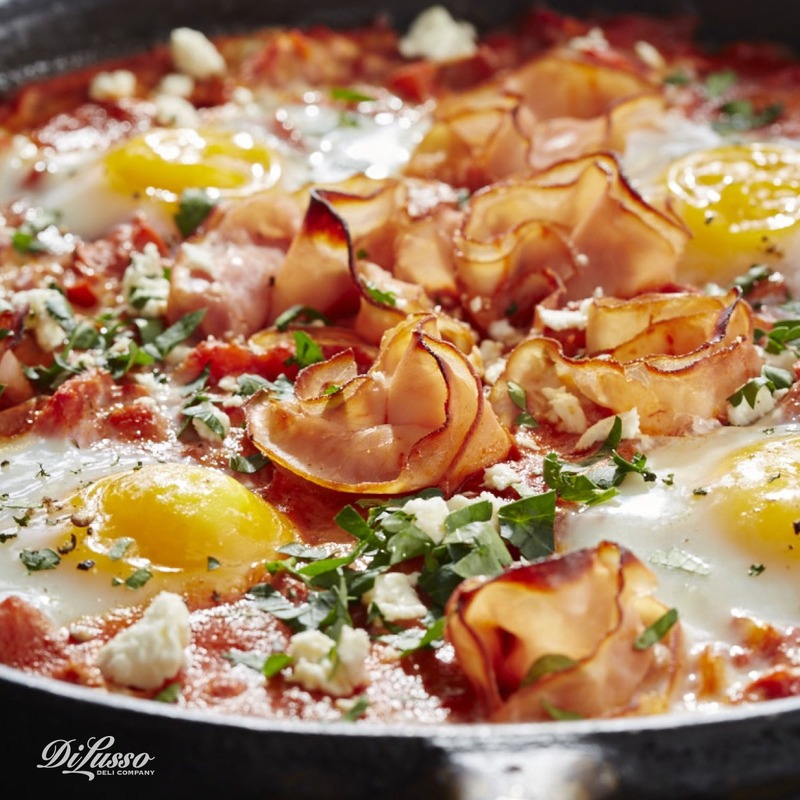 Our Shakshuka-inspired dish uses a traditional, mildly spicy tomato-based sauce and includes brown sugar ham folded into florets to capture delicious pockets of sauce with crumbled feta cheese on top. Serve with some crusty grilled and buttered ciabatta, and feel transported. Our next stop takes us due east to the crossroads between Europe, Asia and Africa to one of the most gorgeous seaside landscapes on earth: Greece. Greek vistas of bright white homes against the deep blue of the Mediterranean Sea provide a contrast as fresh and beautiful as the fresh and flavorful cuisine they’re known for. 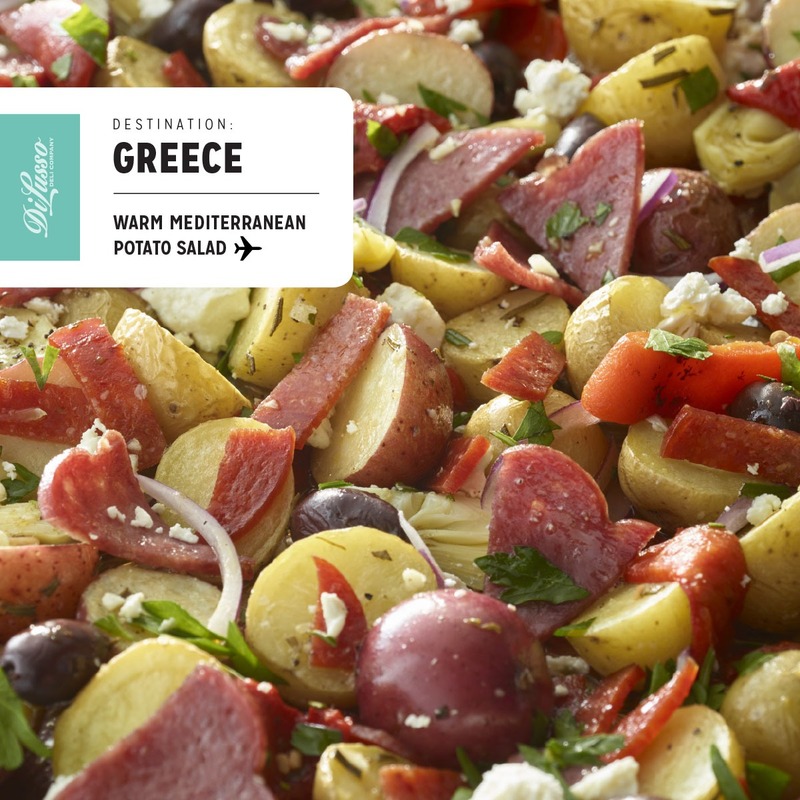 Our Warm Mediterranean Potato Salad features hard salami, pepperoni and roasted red pepper strips tossed together with herbs and new potatoes. These delectable and tangy ingredients mix perfectly to create colorful and complex flavors in every bite. We’re on to Vietnam, where their distinctive cuisine is rich with complex flavors and fragrant herbs like mint, cilantro and Thai basil. Banh Mi, pronounced [bun-mee] is a Vietnamese term for bread, specifically a small and thin baguette that is often filled with meats, pickles and other fresh ingredients. 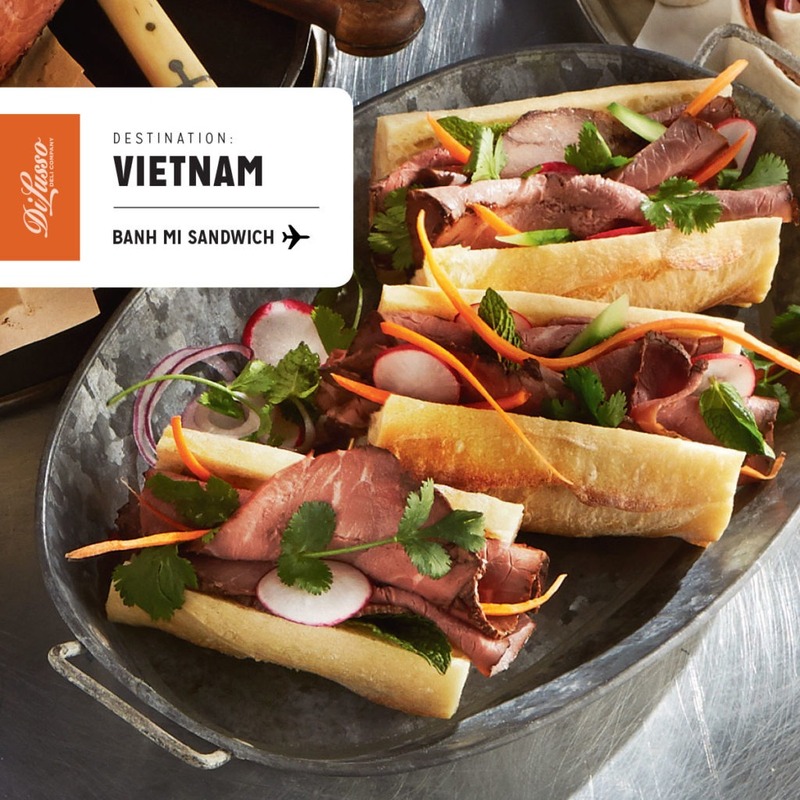 Our Vietnamese Banh Mi Sandwich is generously layered with luscious folds of rare roast beef and drizzled with peanut sauce for a sweet and spicy contrast. We suggest an easy bottled sauce, but you could make the sauce as well. Sliced radishes add a spicy crunch, with cilantro and mint bringing in cooling, fresh flavor. 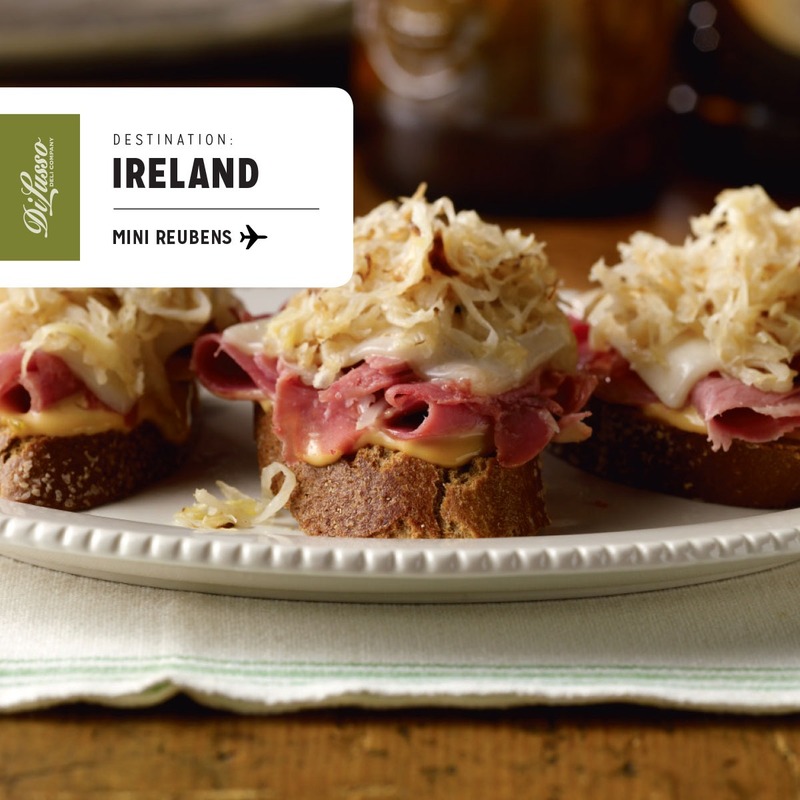 4,000 miles away, in the North Atlantic, sits a lovely island with lush landscapes and luscious foods – Ireland. We’ve incorporated corned beef, cured in the traditional style and flavored with an authentic mix of spices into a version of the classic Reuben sandwich. Our version is bite-sized and perfect for entertaining or doubling up on as a hearty lunch or dinner. Each of our Irish Mini Reuben Sandwiches is topped with sautéed sauerkraut and tossed in a lovely blend of Russian dressing, honey mustard and fresh dill. We recommend serving with a rich and dark pint of your favorite Irish brew. The final stop on our world tour lands us just south of the US border. 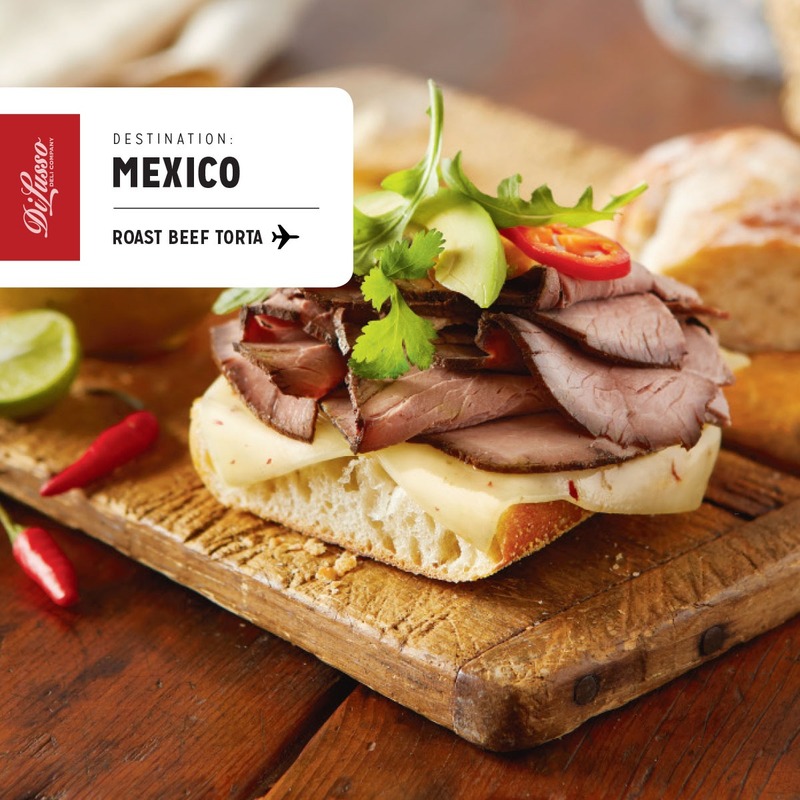 It’s hard to even say Mexico without thinking of all of the delicious foods and flavors we’ve come to love. One of our many favorites is this Mexican Torta, an open faced sandwich layered with cajun style roast beef, pepper jack cheese and refried beans. Cool the spice and heat with sliced avocado, and a few sprigs of cilantro and arugula. This is a sandwich you’ll want to visit again and again.